Broken Sprocket Garage and Devil Chicken Design are please to announce another installment of Voodoo & Burnt Rubber. While our time at Broken Sprocket Garage in east Aurora has been great, we have outgrown the garage space. We are moving our event to a larger venue in downtown Buffalo. Space Buffalo, 1711 Elmwood Ave., will host this year’s festivities. Don’t worry … the event on July 23 will still feature everything that has made it great: art, motorcycles, cars, food and music. For VBR IV we have added invited bike builders to our event alongside our usual contingent of local and national artists. That’s not the only change that you can expect this year. One of the hallmarks of our show has been our charity raffle, which has raised close to $10,000 in three years. Due to the increased size of the show, we won’t be able to hold our raffle in its traditional form. That doesn’t mean you will be going home empty handed. This year we are giving away a custom Sportster! That’s right, a one off chopper built by Broken Sprocket Garage. Tickets are $40 and available now at Broken Sprocket Garage and the pre-party on July 22nd at Century Grill and the day of the event. You must be present at VBR IV to win the motorcycle. In addition to the main event on Saturday, July 23, we are holding a pre-party at Century Grill, 318 Pearl St., Buffalo, starting at 8 p.m. The pre-party will feature a huge raffle with items donated by great local and national industry sponsors. Raffle bike tickets will be on sale as well. Food, drink and good times for all! The founders of Voodoo & Burnt Rubber are dedicated to raising awareness of the WNY motorcycle culture and to providing funds to our chosen charities. We will be donating all of the proceeds from the event to the Rural Outreach Center and Pets for Vets. The mission of the Rural Outreach Center, located at 730 Olean Road, is to assist, empower and elevate the impoverished rural population in southern Erie County and surrounding areas. The organization does this through numerous community outreach initiatives. For more information, please visit www.theroc.co. A national organization, the Pets for Vets program is dedicated to supporting veterans and providing a second chance for shelter pets by rescuing, training and pairing them with America’s veterans who could benefit from a companion animal. For more information, please visit www.petsforvets.com. For more information, please visit our website at www.voodooandburntrubber.com. 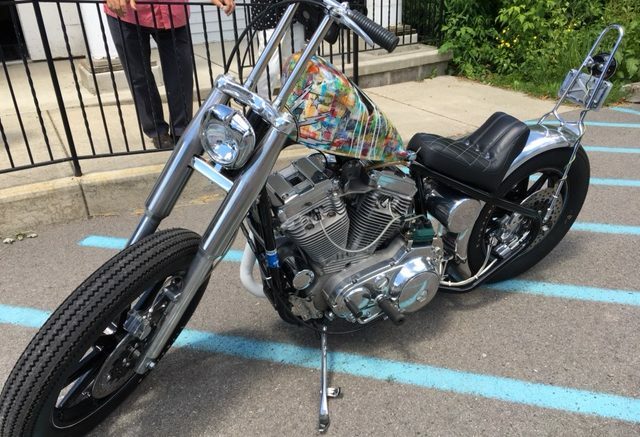 Be the first to comment on "Art, motorcycle and car show to benefit local organizations"